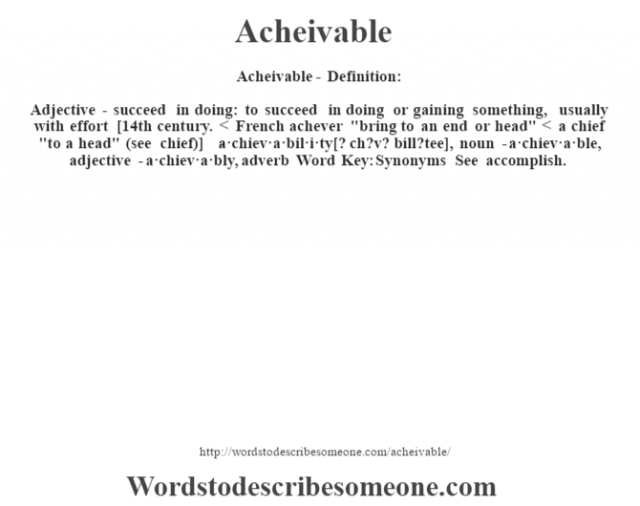 Adjective – succeed in doing: to succeed in doing or gaining something, usually with effort [14th century. < French achever "bring to an end or head" < a chief "to a head" (see chief)] -a·chiev·a·bil·i·ty [? ch?v? bíll?tee], noun -a·chiev·a·ble, adjective -a·chiev·a·bly, adverb Word Key: Synonyms See accomplish.